The world is full of wanderlust and daring, of adventurers and pilgrims who journey far, conquer high mountains and cross empty seas, woo us with their exploits yet invariably, return home to regain less extraordinary lives and to dream again. No so Christopher Many and Laura Pattara: long-term motorbiking overlanders and esteemed writers who have lived most of their lives on the move. It’s been 20 years since Chris hit the road and in October this year the pair celebrated another overland motorbiking journey: five years across three continents, documented in Chris’ second book Right Beyond the Horizon. Travel for them isn’t about dipping in and out of exotic destinations and heading back home because amazingly, these gypsies carry everything they own on their bikes, and that’s just the way they like it. Their unique story began nine years ago when they met in Malawi, halfway through Chris’ second world expedition. 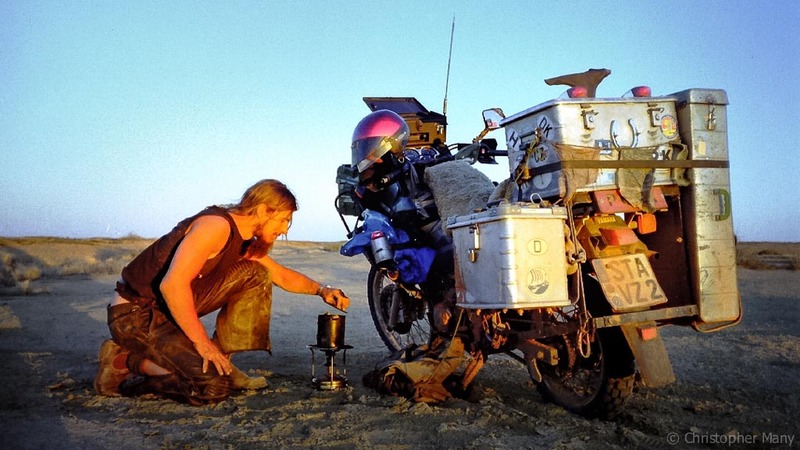 Chris had already ridden his beloved Yamaha Tenere motorbike from Europe to New Zealand and was on now circumnavigating the world by Land Rover. Laura was tour guiding through Africa and Chris had parked his dusty, dilapidated Land Rover “Matilda” in her favourite Malawi campsite, etched with a role call of every place Matilda had been. Laura says “I remember thinking, ‘there is no way in hell this shitbox has gone through all those countries for all those years. I’ve got to find out what this is all about. We had 24 hours together and I asked him which were his two favourites countries and he said Italy and Australia,” says Laura, an Italian-born Aussie. When Chris was ready to leave Africa and Laura was too, she phoned her Mum. “Listen, I said, there’s just this really weird dude, in a car, from Germany and he’s driving back to Europe. My mum’s like ‘Oh my God, Oh my God’ and I thought ‘there’s an airport half an hour outside Nairobi and if I spend half an hour in the car with him, I’ll know, and he can drop me off at the airport (if it all goes bad)”, she says. “Nine years later, every time we get close to an airport he slows down”. They got to know each other driving Matilda north through the Middle East to Europe where Chris hunkered down to write his bestselling first book Left Beyond the Horizon: eight epic years of travel, 200,000km, five continents, 3000 days. Soon after publication, Laura started motorbiking too, learning to ride on the long journey south to Australia, and five years later, she’s riding still. Their chock-a-block passports could tell a thousand tales, but what impresses me the most about this laidback, carefree pair is their utter minimalism. Unshackled by four walls and what fills them, they carry everything they own on their motorbikes and own nothing more than they need. Laura is quick to point out that the gradual shedding of her personal possessions and shaking off the structure of city life took some effort. “I had to do it in baby steps. It was cathartic to get rid of everything and I like to say that I’ve worked really, really hard to own very, very little”, she says. Chris, on the other, never got on the hamster wheel, moving out of home aged 18 into a VW camper. When he wanted to leave Europe back in 1997, preparation took 10 minutes. “I thought to myself, I have everything already, let’s go”, and he did, setting off on what turned out to be a four year motorbiking journey across the world, north to south. “I didn’t know how long I’d be on the road for,” Chris says “I thought, ‘lets just give it a try, maybe one year, maybe two’”. Three years passed and after four years he had ridden from Germany to New Zealand via India, Nepal, Turkey, Iran, Pakistan and Afghanistan, Southeast Asia, Singapore and Australia. When he flew back to Scotland he found Matilda (the Land Rover) sitting on a farmer’s field in the Highlands and fell in love, parting with $1100 to call her his and hitting the road once again on four wheels instead of two. His two bestselling books take readers on grand adventures, but understandably after two decades of travel, Christopher’s books raise many questions about life, politics and culture in some of the most far-flung countries on earth. These dialogues and his unique take on travel have won Christopher many fans, especially in his German homeland, some of whom report back from their own epic journeys, and plenty of armchair travellers too. According to Chris, it doesn’t really matter how or how far you travel. “The enjoyment of a journey does not depend upon its duration, the mode of transport or the destination. The individual is the one that makes or breaks the journey,” he says. Chris and Laura say there is nothing overcomplicated about what they are doing. Overcomplicated…no, inspiring…most definitely. And while they admit there have been sacrifices – no children for starters and no security in the physical sense – Laura says she has moved beyond needing something to show for her time on the planet. “You don’t need to see it. Why is (a home) of any more value than simply what I have in my head or what I have in my heart, and how good I feel about my life,” she says. Laura and Chris have big plans for a third world adventure together, this time in the comfortable camper they plan to build in 2018. “I think after 6 years living in a tent on this trip we’ve earned ourselves 3.5 metres by 2 metres of comfort,” Chris laughs. But there are plenty more dreams on their bucket list: a year building a log cabin in the wilderness, 12 months climbing Europe’s highest peaks, sailing around the world? “99% of decisions can be made over a single cup of coffee. By the time the coffee cup is empty, one of us has said ‘lets do that”, says Chris. And they do. Good one Laura and Chris 🙂 Love the pics and story !!! !